At the end of every wet season swimmer's wait, left high and dry as an alarming number of estuarine crocodiles are cleared from the Northern Territory’s most popular waterholes. Yet just across the Queensland border in remote Boodjamulla National Park, campers splash about in a spring-fed savannah oasis that might just be the best destination in the far north for adventurous water-lovers. 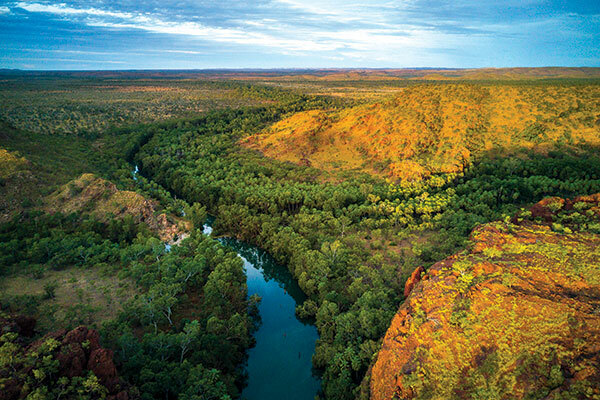 Traditional owners say that the Boodjamulla (or rainbow serpent) carved Lawn Hill Creek’s vivid, palm-fringed waterway from the sandstone plateau, blazing a path across the plains towards the Gulf of Carpentaria. Today, the former Waanyi hunting grounds and pastoral property-turned national park sanctuary easily outranks its NT rivals for river frontage campsites, budget priced stays and easy, breezy, no-rules paddling. 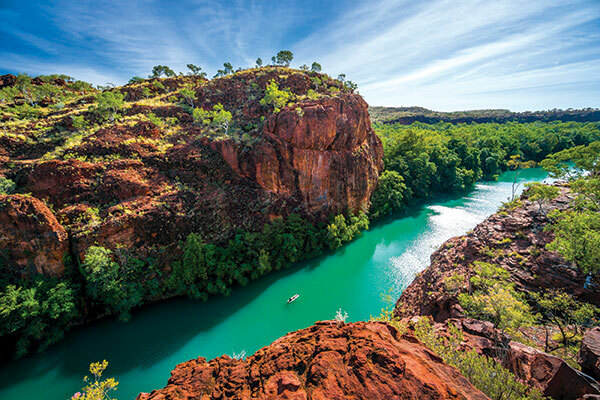 The swimming is sheer heaven after time spent hiking Boodjamulla’s network of short trails, and the wildlife encounters —the harmless freshies, raucous flying foxes, wallabies and more — make this far-flung destination all the more appealing to off-the-track travellers. There are no park entry fees and the spacious riverside campsites cost a tiny $6.15 per person, leaving plenty in the kitty for canoe rentals, hot meals and cold ales at nearby Adels Grove. The national park also throws a protective border around nearby Riversleigh World Heritage Area where you can discover the weird and wonderful fossilised remains of 25 million-year-old Aussie mega-faunalaw . 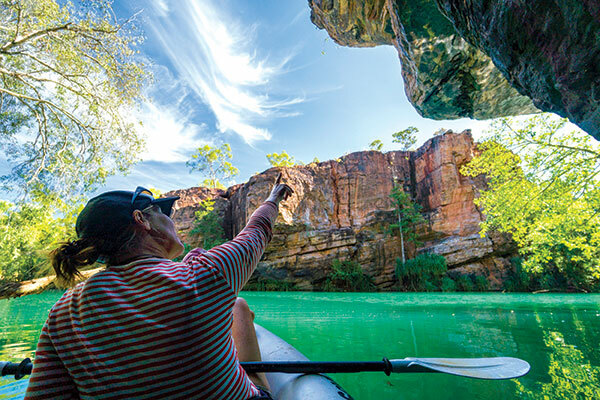 Paddling Lawn Hill Gorge is the number one thing-to-do at Boodjamulla, and because it’s impossible to be content with just a few hours in a rental canoe, you’ll want to make some space on board for your own boat. That way you can be first on the creek at dawn (before the rental stand opens) to watch the sun ignite the sheer rock walls, and linger late when this waterway will be all your own. 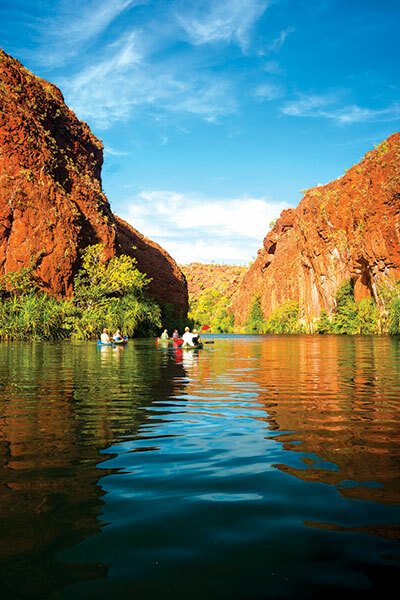 From the national park campground on Duwadarri Waterhole, a paddling trip into Upper Gorge and back takes up to three hours. If you manage an early start you’ll be rewarded with solitude and as you enter Middle Gorge, the chance to catch the rising sun as it colours the red cliffs that shoot skywards. Upstream and around the bend, lilies carpet the way to Indarri Falls, short limestone tufa falls that stalls Lawn Hill’s crystal-clear creek, sending it cascading over a broad two-metre high drop. 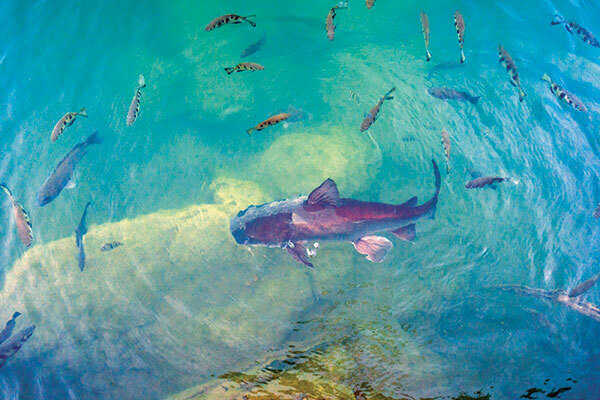 This is a great place to cool off and with a mask and snorkel you can eyeball the giant catfish, spitting archerfish and the snapping turtles that thrive in the clear, 30 metre deep pool beneath Indarri. Once the sun is high in the sky, this energising spot is irresistible for a dip. A lookout just above the falls provides a grand vista for very little effort too. Indarri Falls separates Middle and Upper Gorges, blocking the way upstream. To explore further, you’ll need to get out and portage your canoe a short distance along the banks. Paddling Upper Gorge is a quieter experience because not everyone makes the effort. That means you are bound to spot more wildlife – crimson finches flitting amongst the pandanus, and at dawn and dusk, the wallabies and wild pigs that appear to drink at the water’s edge. When you reach the pretty cascades at the head of Upper Gorge you can tie up your boat and picnic on the banks in the invigorating mist, toying with the archerfish that spit and jump for insects. These jumpy little fish feed by spraying out jets of water to knock down insects, frequently launching themselves clean out of the creek to the great surprise of paddlers whose fingers often attract a nibble too! 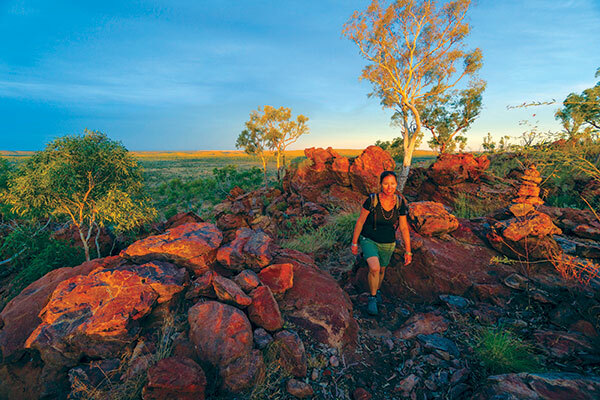 Of all the walking trails that lead along the gorge rim and delve deep into Boodjamulla National Park, two favourites stand out. My top pick for an early morning stroll is Wild Dog Dreaming (4.5km/1.5hrs return) where you’ll discover 10,000 year-old Indigenous rock art, petroglyphs, and a midden of mussel shells and stone artefacts. You might also hear (and then meet) the huge colony of little red flying foxes that unexpectedly moved into Lower Gorge in winter 2017 for the first time in recent history, according to park rangers. Linger here to spot freshwater crocodiles sunning themselves on the banks below. At day’s end, a scenic trail skirts alongside Lawn Hill Creek and climbs the Constance Range to a grand viewpoint over the gorge and the endless spinifex plains and sandstone outcrops that stud the landscape all the way to the far horizon. If you tackle this short hike in time for sunset, remember to carry a torch for the trip back down. It’s not too taxing a distance at 4km (return) and it takes about three hours to complete. Other worthy leg-stretchers include the stiff ascent to Duwadarri Lookout above Middle Gorge for 360 degree views (600m/30mins return), and the Island Stack track that elevates you to panoramic viewpoints across the escarpment and loops around the edge of its tabletop formation (4km/2hrs return). On the edge of Duwadarri Waterhole, Boodjamulla’s oh-so-popular national park campground provides just 20 spacious sites, guaranteeing plenty of elbow room and a good chance of quietude after dark. The price is right at just $6.15 per person, per night, and you can’t beat the camp’s proximity to the water. Easy access to the gorge means you can cool off at any time, get your canoe wet early or paddle until the daylight fades. Although you’ll need to make a booking well in advance during the popular wintertime travel season, sites are not allocated so you can take your pick of what’s available when you arrive. The trick is not to show up too early in the day or late risers won’t have vacated their campsites yet. Overall Boodjamulla’s campground is well appointed with toilets and cold water showers, water taps dotted around camp and an interpretive shelter. Helpful national park rangers are available to answer questions, provide advice and dispense walk trail maps. About 10km away, the cushy camp at Adels Grove provides two things that the national park doesn’t: hot showers and cold ales. Although none of the campsites come with power, you can enjoy a campfire and pets and generator use are permitted in the spacious, demarcated sites furthest from the creek. There’s a restaurant and bar, fuel and gas are available and a small shop sells all the essentials that are easily forgotten. Down by the river, the Grove’s shady, free-range campground gets mighty busy in peak seasons, but if you manage to nab one of the waterfront camps you probably won’t want to leave, ever! Campfires are permitted at the Grove but dogs aren't and neither are generators, so solar panels are de rigueur. The downside is that when you want to tackle a national park walking trail or launch your canoe or kayak, you’ll need to drive back into the national park. All the creature comforts at Adels Grove come at a price - $18 per person to be precise! 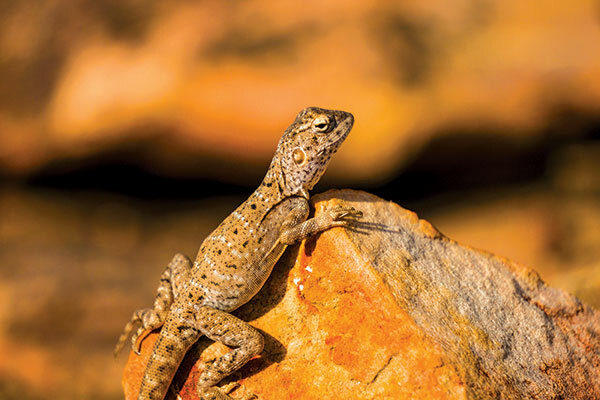 About 50km from Lawn Hill Creek, world heritage-listed Riversleigh is a popular day trip destination that showcases the fascinating fossilised remains of 25 million year-old prehistoric mega-fauna. Think meat-eating kangaroos, giant wombats, carnivorous lions and an almost complete skeleton of a thylacine – all of which have been unearthed on site. You’ll encounter some of these along a short, self-guided walking trail that loops around D site. As you explore, interpretive signage points out the fossilised bone of a five metre-long freshwater crocodile and an oversized Riversleigh turtle, and there are bone fragments everywhere you look. Not only is Riversleigh Australia’s richest known mammal fossil deposit but it’s also one of the world’s most significant. More than 300 fossilised species were discovered at Riversleigh in the 1960s, and the most impressive you’ll encounter on the trail is the rocky remains of Big Bird: limb bones and gizzard stones of a flightless thunderbird or dromornithid that reputedly stood around 2.5m tall and weighed 250-300kg. Close by, Miyumba Bush Camp on the Gregory River is a quiet spot to overnight, especially if you are tackling the rugged shortcut back to the Barkly Highway and Mt Isa (330km). For national park daytrippers, a detour to Riversleigh is a great way to fill a morning, leaving plenty of time to swim and paddle back at Boodjamulla before sunset. 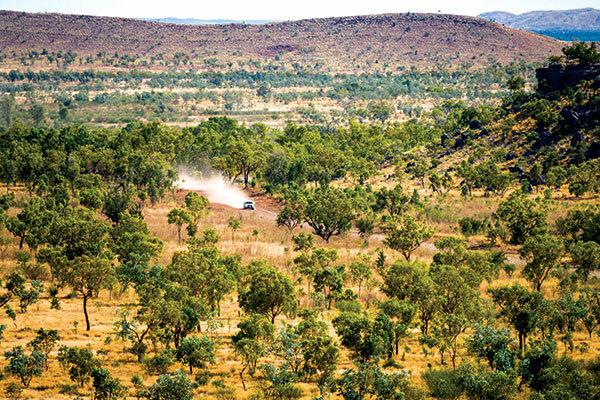 Location: The smoothest route to Boodjamulla (Lawn Hill) National Park is via the Wills Developmental Road, 100km west of Gregory. Expect corrugations and dust west of the mine entrance. From Mt Isa, a more rugged route pushes 330km northwest to the park (allow four hours). Camping & facilities: There are no entry fees and campsites cost $6.15 per person, per night. Water is available (boil first) and facilities include toilets, coldwater showers, picnic tables and a park interpretive shelter. No pets, campfires, generators, fishing or motorised boats are allowed in the national park. Best time to visit: Expect cool, dry conditions (12-28°C) from May to September. The park is busy during school holidays and may be cut off by wet season rains from December to March. 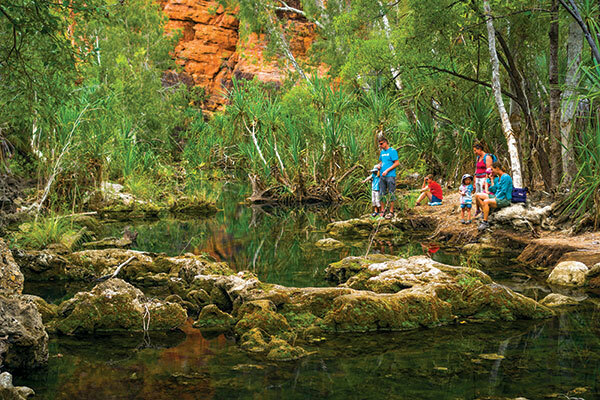 Contact: Book all campsites in advance for stays from April to October (www.npsr.qld.gov.au, phone 137 468). Adels Grove can offer camp sites when the national park is full. Find out more at www.adelsgrove.com.au. Check out the full feature in issue #120 of Camper Trailer Australia magazine. Subscribe today for all the latest camper trailer news, reviews and travel inspiration.